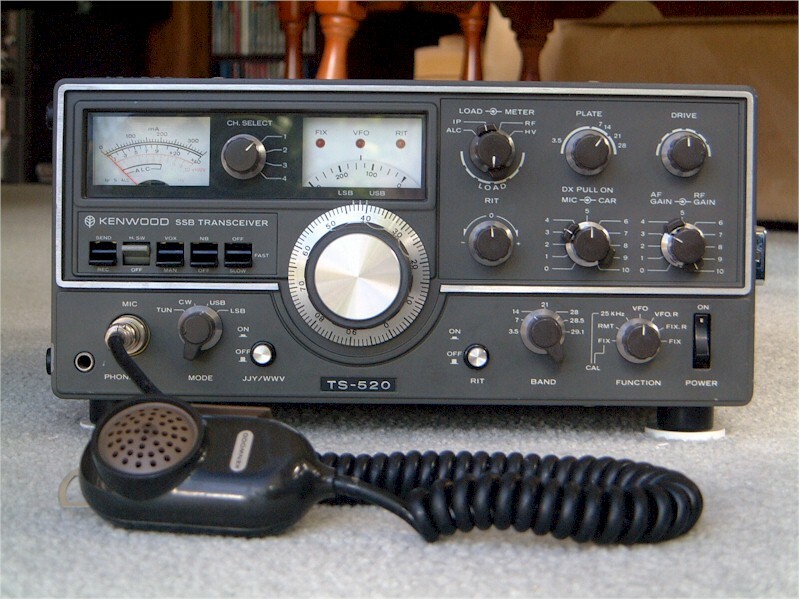 Kenwood (Trio) TS-520 200-watt amateur HF transceiver. Transmitter is hybrid, with solid state exciter circuitry, 12BY7A driver tube, and a pair of S2001 (Asian 6146) final tubes. The transmitter has a classic pi network. Tuning is all mechanical, including the VFO, which tunes 600 kHz segments on 80m through 10m (10m covered in 3 segments). Driver and receiver circuits are peaked with capacitors ganged with a chain drive. All controls must be peaked repeatedly as the operator changes frequency. The back panel features a jack for a VHF transverter, an accessory that was never marketed. The knob beside the meter is the "fixed frequency" channel switch. The operator could install 4 crystals for his favourite frequencies, allowing him to bypass the tunable VFO. I rewired the switch to control an active audio filter that I built from a circuit from the 1979 ARRL Handbook. "DX Pull On" enables the rudimentary speech processor. More of a speech harshener, but still useful. This was a very successful product for Kenwood and is so highly regarded that many are still in use 40 years later. The 520 was evolved into the TS-520S by adding 160 meters, and then the TS-820S with digital readout -- but retaining the mechanical tuning. I was the second or third owner when I purchased it in 1979. The TS-520 may be operated at reduced power from automobile 12 volts. A built-in inverter utilizes windings on the main power transformer. I mounted the 520 in a 1971 Firebird and used it with Hustler antennas until I replaced it with an Icom 735, which is much easier to use while driving. The TS-520 was stored for 20 years but worked OK when I dusted it off and made a few contacts during the 2011 Field Day contest.